INCLUDES DIGITAL TOOLS ON PDF! Every day brings us a crushing wave of demands: a barrage of texts, emails, interruptions, meetings, phone calls, tweets, blogs—not to mention the high pressure challenges of our jobs—that can be overwhelming and exhausting. The sheer number of distractions can threaten our ability to think clearly, make good decisions, and accomplish what matters most, leaving us worn out and unfulfilled. Kory Kogon is FranklinCovey’s Global Practice Leader for Productivity focusing her research and content development around time management, project management, and communication skills. 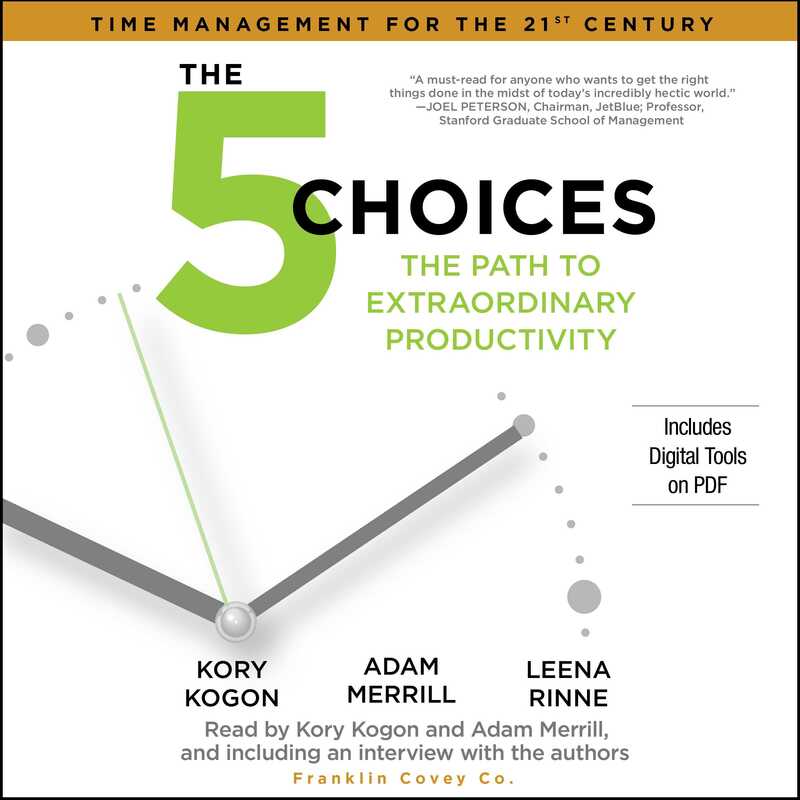 In addition to coauthoring The 5 Choices: The Path to Extraordinary Productivity, Kory is one of the authors of Project Management for the Unofficial Project Manager, and Presentation Advantage. Prior to FranklinCovey, Kory spent six years as the Executive Vice President of Worldwide Operations for AlphaGraphics, Inc.
Adam Merrill is vice president of innovation for FranklinCovey, where he leads the effort for developing award-winning content that helps individuals and organizations become dramatically more productive. Adam has been researching time management and productivity topics around the globe for over twenty-five years, with particular emphasis on the impact of changing technology on how people succeed in a digital world. In addition, he is also deeply immersed in the impact physical and mental health have on one’s ability to be productive and make good decisions. Leena Rinne is a senior consultant with FranklinCovey. In her role, she works with clients to increase productivity and develop leaders in their organizations. Leena works with a wide variety of organizations, ranging from Fortune 100 companies to small, locally owned businesses.